Such a great combo for yourself or for gift giving! 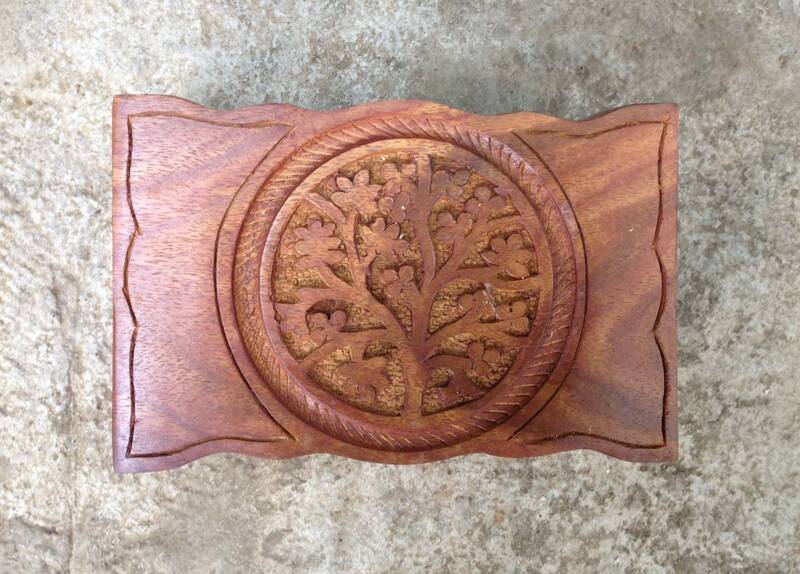 A beautiful Tree Of Life 4 x 6 inch carved Indian rosewood box with one 30 g. (1 oz.) bag Frankincense resin, and one 30g. (1 oz.) 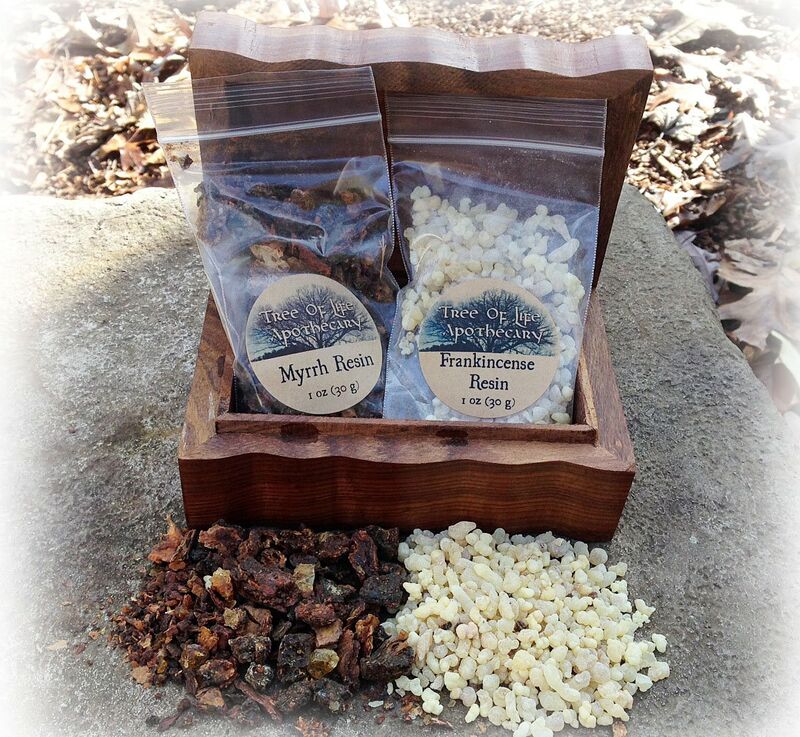 bag of Myrrh resin. Perfect addition to your altar, incense cabinet, or sacred space! Add to your energetic smudging practices, or just for the lovely scent of pure Frankincense & Myrrh! You will also receive an information sheet on smudging and resins. Frankincense (Boswellia carteri) is a well-known and loved resin in ancient times, as well as modern. In days of old, the highly perfumed resin of frankincense, was as valuable as gold. It is said that the plant spirits of this resin can invoke the Divine. 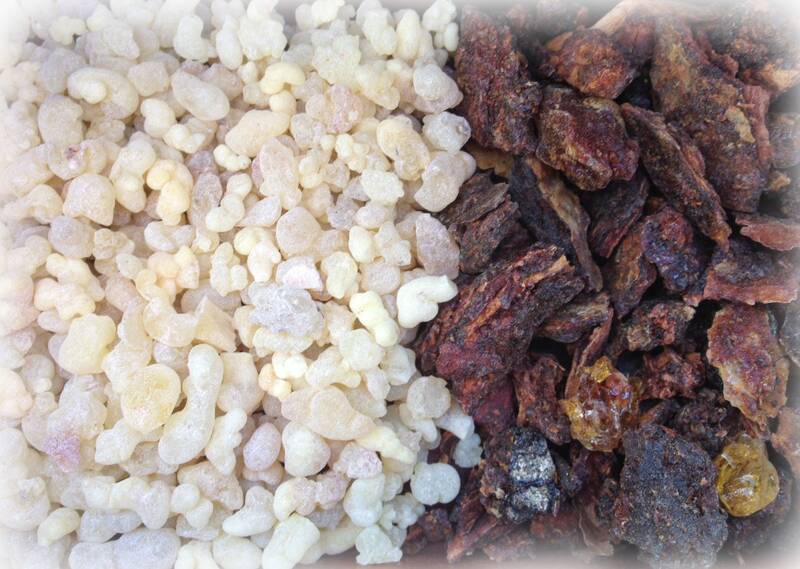 Frankincense is a truly wonderful resin when physical healing is needed. Burn during any illness or infection, viral or bacterial. Burn in sickrooms and homes where a person has been ill, or simply to prevent illness from taking hold and prevent infection when exposed to the sick. In spiritual practice, frankincense creates a sacred atmosphere that enhances meditation, reduces stress and tension, and uplifts one spiritually. It may heighten the awareness of spiritual realms that may lie hidden within the physical. Frankincense has been continuously used for over 3,000 years in magical and religious ceremonies and can deepen any religious experience. It focuses spiritual consciousness and evokes the potential for transcendent awareness. Native to the Middle East and North Africa, frankincense was used for religious purposes since earliest times. From the worshipping of the sun god RA by the Egyptians, or the god Apollo by the Greeks and even being presented by Balthazar, one of the three wise men, as an offering to the infant Jesus, this resin incense has been used by humankind for a connection to spirit. It may be used for any type of spiritual ritual or to enhance meditations. Myrrh (Commiphora myrrha) comes from a thorny shrub bearing small white flowers that grows in the Middle East, North Africa, and Northern India. It possesses a richly bitter scent. Prized for its opulent and enduring perfume, myrrh was seen as a magical substance that was capable of connecting heaven and earth. The Egyptians believed that the golden drops of resin were the tears of Horus, the falcon-headed sun god. Known as punt or phun, it was included in their sacred perfume Kyphi, burned at sunset as a thanks and offering to the sun god, Ra. The Egyptians also used it during funerals and in embalming rituals, as it was thought to accompany the soul on its journey to the spirit world and afterlife. The Hebrews drank wine flavored with myrrh to prepare them for worship. This was also one of the three gifts that the wise men presented to baby Jesus, and was also featured in his death, when his body was anointed with a mixture of myrrh and aloes. This exotic substance has been used in spiritual practices for at least 4,000 years. Inhale the scent of the burning incense or crushed resin to awaken your awareness of the spiritual reality behind our everyday existence. It is a great tool to use before prior to or during rituals and meditation, as it strengthens the link between our crown and base chakras. The result can be expanded awareness, tranquility, and the calming of fears and halting the questions concerning the future. Myrrh essential oil is also used for wound and skin healing. Or the resin may be burned and the scent inhaled with visualization to speed healing of the physical body. Plant resins, being less processed than essential oils, hold more essence of the plant and more spirit energy. This concentration of the "blood" of the plant is what make them powerful reservoirs of natural energies. They are different than essential oils and are meant to be used in different ways. The most common way to use resins is to place them on a burning piece of charcoal tablet allowing the aroma of the smoke to fill the space, releasing its energy and essence. They are also a key ingredient in making true and real incense combined with essential oils and finely ground woods, such as sandalwood. They can be used for their aromatic qualities alone, as an aid to holistic healing, and of course in spiritual and religious rituals. We burn them alone, or in combination with one another and occasionally combine resins with our herbal smudges in the smoke bowl, to enhance the effects of the herbs. Smudging with sacred herbs and resins is a tradition as old as time, utilized by peoples of most spiritual and religious traditions. All herbs and resins have individual healing properties, known to our ancient ancestors, and used and appreciated in modern times, as well. To smudge yourself or another, direct smoke (this is typically done with a feather) toward the heart first, then over the head, down the arms and the front of the body. To smudge a home, open windows if possible to allow the room to clear. Walk room to room wafting smoke as you go, say a personal blessing if needed. For objects, waft smoke over object or pass object through the smoke (if small). *It is always recommended to protect your burning bowl with a bed of sand or ash, as it can get rather hot if using a charcoal to burn. Smudging is a common vernacular for the sacred smoke bowl blessing, a powerful clearing and cleansing technique for your body, tools, crystals and home. Smudging is a recommended and welcome practice on a frequent basis to clear negative or stagnant energy, clear energies from your body and mind after work, and to purify the air during and after illnesses of all kinds. Also a wonderful tool to cleanse new items entering your home, or after visitors exit, to neutralize and charge the air with positive energy. Smudging can, and should, be done during ritual of any tradition, to create sacred space, and charge ritual tools. From our home in the foothills of North Carolina to yours...happy smudging for your health and wellbeing. Smudge daily! This generous bag is sold by weight not volume, and should last a couple months with regular use. Some settling may occur. This is a natural product, some variations may occur. *Disclaimer* I make no medical claims as to the efficacy of this product, only personal experience. The information in my shop has not been evaluated by the Food and Drug Administration. This information is not intended to diagnose, treat, cure, or prevent any disease.